Development Update: Actions, Perks, And Stats — Oh My! Home / Development Update: Actions, Perks, And Stats — Oh My! Let me walk you through how this all works. On the left is the Grrbl you are editing. The 4 icons below represent the 4 gear cards you have equipped. There is an armor card, a helmet card, and 2 weapon cards. Each gear belongs to a class. In this particular case this Grrbl has a wizard helmet, a knight armor, a lawyer briefcase, and a knight sword. When you equip a gear card it adds placeholder cards for either stat cards, action cards, or perk cards. The stats row is empty because I’m literally continuing to finish that as soon as I finish this post. The middle row is the actions row. These are the actual “actions” the Grrbls can perform in battle. The bottom row is the perks. These are passive bonuses and special actions for the Grrbl. Armor and helmet cards determine the quality and number of perk cards you can choose, and also determine the class it comes from. 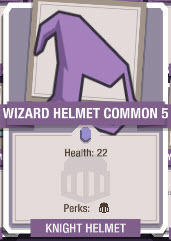 So if you equip a wizard helmet, you will then need to equip wizard perks for however many perk slots it provides. If you equip lawyer armor, then you will need to equip some lawyer perks. The same is true for the weapons, only instead of perks, you will be picking actions. In this way you can multi-class a Grrbl with up to 4 classes. All gear will give you stat slots and will also have a primary stat bonus as well. Up until now, I had been putting many stats on the gear cards. However I really loved the idea of decoupling stats from gear. I always wanted gear to be a tactical choice in terms of game play expression, and I found that when I tied too many stats to a card, it muddies the water. 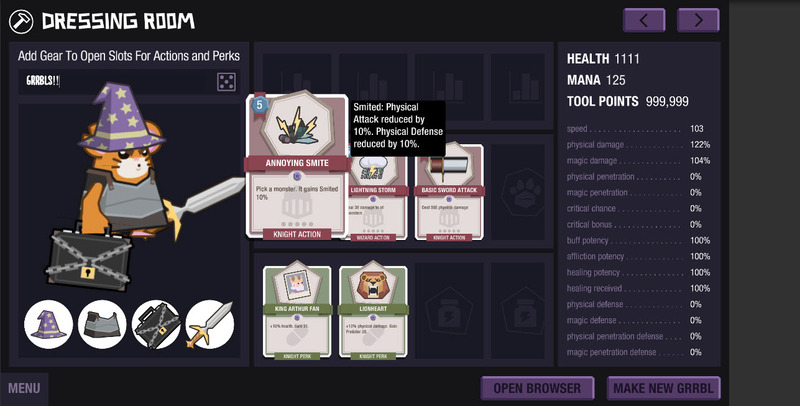 I wanted the player to be able to clearly choose the tactical value of a gear card and independently set the stats of his Grrbl to his liking. I think this opens up more game play and makes choices more meaningful. Towards that end, gear now provides 1 main bonus of either Health, Mana or Tool Points (more on this later) and then it just provides stat slots for the player to fill. I did want to include 1 stat boost on the gear because as the gear gets more powerful, that primary stat gets a boost. But in addition, gaining Health, Mana, or Tool Points is universally useful and you will always be able to find (with some effort) the ‘sister’ gear card which provides the same utility but with the primary stat you desire. So all is very well on this end I absolutely cannot wait to share more with you. Feel free to ask any questions you might have.